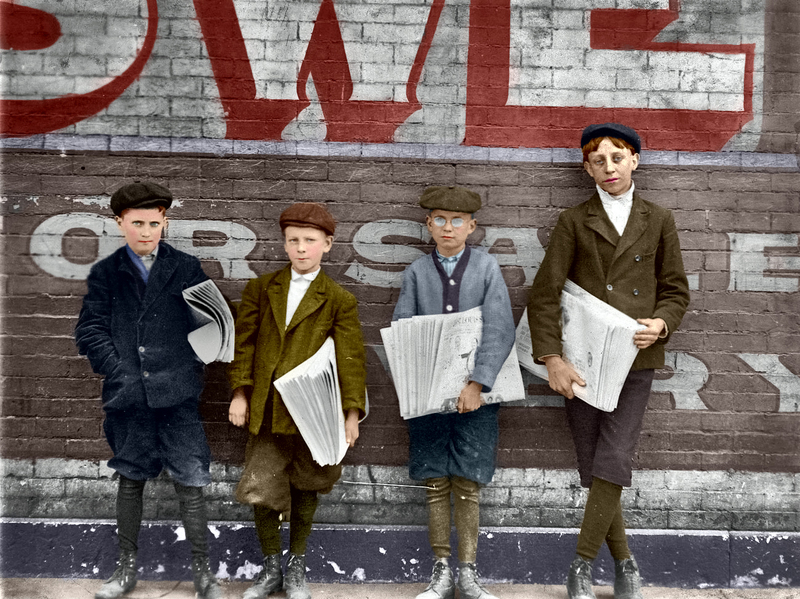 Newsboys in St. Louis, 1910. Photo by Lewis Wickes Hine, colorized by Frederic Falcon. Image via Shorpy. View the non-colorized image here. Despite that this blog is called "Art Advocacy for Educators," thus far advocating educators haven't gotten much play. We've got advocacy, and we've got art educators, but the twain have not yet met. Perhaps it's somewhat akin to "Rhode Island is neither a road, nor an island. Discuss." (Any mid-1990s SNL fans? Anyone?) Well, this travesty has gone on far too long, and it's ending with today's post. I am finally literally interpreting the mission of Art Advocado! Read on to find out about a music teacher who took to the local 'papes (as the boys above would call it) to advocate on behalf of her program. Sondra Collins, a music educator in Marion County, Florida, took to the Ocala Star-Banner this past weekend to make a passionate but rational argument for strengthened music education in the county school system. Collins describes how much she loves her job as a music educator. She admits she knows times are tough - and illustrates this through the music educator to student ratios in Marion County schools (one teacher to over a thousand students, in most cases). Collins pulls another very effective stat out of her back pocket: most students in Marion County will only receive 9-12 hours of music education in school this year, which is half of what most students in Florida receive. Think about that - nine to twelve hours! For many people that is a single work day. Of course, a little is better than nothing, but I find these numbers quite striking. (And have spent a LOT of time looking at art education and advocacy stats, good and bad.) Not only does this minute amount of time shortchange students, but it also doesn't fulfill the Florida Department of Education Music Sunshine State Standards, which require 18-24 hours of instruction per academic year. Collins closes with a proposed temporary solution to the dearth of music ed in Marion County: fill vacant music teacher slotswith full-time substitute teachers, as is the practice for vacancies in other core subjects. (As Collins points out, art and music are core subjects under No Child Left Behind!) This influx of educators will to ensure Marion County students receive the 18-24 hours they deserve- and that the Sunshine State Standards for Music Education require. "The bottom line is that this is not about the music teachers," Collins writes. "We are concerned about the amount of music education that these students will now be receiving." In her op-ed, Collins lays out what is, to my mind, a tight argument for the return of music education to Marion County - combining passion and ration with hard numbers and a proposed solution. Her piece could easily be presented to a school board or city council as-is. But it's not just the argument that is strong - it's also the strategy of placing the argument in a local paper, where these hyper-local stats has potential to reach a very relevant audience. Many readers of the Ocala Star-Banner will have a personal investment in Collins' cause as parents of students in Marion County schools. Additionally, parents of adult children who, perhaps, benefitted from more robust music education in earlier years might feel impassioned - and empowered by this information - to take a stand. Plus, like many of my favorite advocacy strategies, it's replicable! I would love to see more art teacher op-eds in the local 'papes. Art teachers! Have you advocated on behalf of your art program, in a newspaper or elsewhere? Tell me about it in the comments!